Make a text box "non editable" or "display only" field? 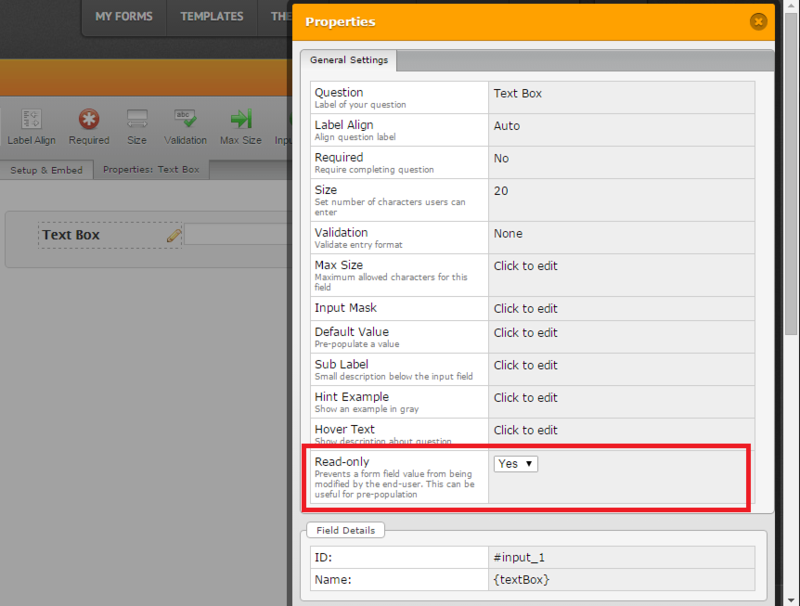 I am passing a parameter value to populate a text box on a form. Is there a way to make the text box "display only" meaning that the user can not edit the value inside the text box? For example: Based on how the user arrived to the form (product purchase) I already know their email address and therefore I pass it to the field "Email". I don't want the user to be able to change the value of the field "Email". Sorry but there is no way to make a text box non-editable without embedding the form using its full source code. 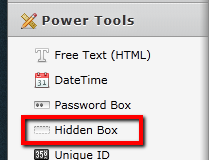 How about adding a hidden box to your form and prepopulating both the textbox and the hidden box? This way, even if the email in the text box is changed, the hidden box will still retain the same email. Yes I've tested and the "Hidden Box" will do the trick. Do you happen to know if there is a way to determine the size of a file that a person uploaded via a form? I'd like to add it as a value in the new form submission email. That way I will know what to expect when I click on the attached file. That would be a cool addition. At the moment they only display the filename and the kind of file attached. For sure JotForm will have it implemented pretty soon. Thanks very much for your suggestion but it's a separate issue to the original topic of this thread. Nevertheless, the idea is a good one and I will forward it to our developers. Again, a form building basic missed by these guys. It's crazy...really crazy. I'm tired of all the "work arounds." How about just getting the basics right. Is this what you're looking for, @jorein & @sjk03060 ? No need to disparage JotForm, @sjk03060. No one's forcing you to use JotForm. Feel free to use another service / platform. I've been with JotForm for over 3 years and they always listen to their customers. Thanks for sharing that info with our users, Adrian. Much appreciated. @sjk03060 This is an old thread which we forgot to update when the read-only feature was introduced some time ago. But we quite understand how frustrating it can be when some basic functionality one would expect to be part of a product appears to be missing. Adrian, I appreciate the feedback and you showing me how to do this very basic function that seemed to have no documentation anywhere else. So far I am not using JotForm. However, I would like to and it's very disappointing and frustrating when you have a tool that has so many advanced features others don't that is rendered unusable by the lack of basic industry standards. There are a lot of work-arounds mentioned on the various threads, and most of them are for things like this that are minimum basic requirements for any form and survey building applications. Things like field and page piping, read-only fields, etc., are industry standards. It's especially strange that they don't even seem to know what some of the concepts are or what they are called. Thank you for your comment. I do not now if your recommendation will be reached, since it is a pretty old thread, but any suggestion always helps.